Agents can enter partial contact information when searching and selecting the contact(s) to receive the report. You can attach a Saved Search to determine the nearby properties as an alternative to the preset radius search. The closest ten properties will display under the new expanded Market Summary section which now includes active, pending and sold listings when available. Online Seller Report Summary is now an editable text area so the agent can add a custom message. Ability to set an Email Frequency specific to the individual report. The report will still go out on Monday but now you can choose for each report how often it will be sent to the contact. Ability to choose to stop sending the individual report when the listing goes Pending or Sold. For more details, see Online Seller Report. Q: Will my existing seller reports, created under the previous version, still go out? A: Yes, the reports will continue to out on the same schedule as before, with the new report format. Q: Can I still send an individual report to an email address, without enrolling them in the recurring report? A: Yes and no. You can send an individual report to all contacts who are enrolled for that report. However, each recipient must be a contact in the LeadStreet system – sending to ad hoc email addresses is no longer supported. Q: Do the emailed reports work on a mobile device? A: Yes and no. The emailed reports should display on all devices, however, some of the information is too detailed for effective use on a mobile device, and will need to be viewed on a tablet or laptop. Q: Will my setting changes be automatically saved? A: No. Auto-save is no longer supported. The Save button must be used after making changes to any settings on the report. When it comes to accepting leads, the old adage rings true, "Time is Money." The faster you can receive and accept a lead, the faster you can make contact with the consumer. In order to receive your lead notifications quickly, we recommend that you setup your account for Instant Lead Acceptance. Lead notifications can be sent to you by text message or email. Please watch the presentation below to learn how to configure instant acceptance of leads using the text messaging feature. Team accounts are a powerful tool within LeadStreet. NOTE: This article applies to team leaders, team assistants or office admins ONLY. It assumes that the team account is already setup and the team leader is assigned. Office managers and admins can learn how to create a team in this Tech Assist article. With the most recent CRM3 update, there have been changes to the automated client emails for Saved Favorites, Saved Searches, and New Property Server emails. The new email format is "mobile friendly" and also include a mobile friendly signature. Each of the new emails shares the same basic standardized template and are not customizable at this time. One other important change to note is that your clients will now receive a separate email for each saved search that has been enabled for automated notifications. The ability to associate calendar items to your contacts by selecting them when creating or editing the event. A new sub navigation menu item ("Calendar") under each contact where you can create and view calendar items for a specific contact. Five different views of the calendar: Day, Week, Month, Expanded, and Agenda with the ability to filter by type and print. The ability to 'drag and drop' to move an event to another day or expand to revise the time of an event. Color display and shading to indicate current day, scheduled, and completed calendar items. The sub navigation items of File Archive and Bulletin Board have been combined into a new page called Messages (to match the term used on the Client Dashboard) in order to make room for the new Calendar. The Upcoming Tasks/Events has been removed from the Leads Manage page (with plans to add to My Dashboard in a future release). All current items have been migrated. You will find those entered as an Event, Group Event, or Vacation/Holiday under the type “Task”. All other types (Appointment, Task, Meeting, Showing, Open House. Phone Call) have remained as is. For more details, refer to the My Calendar guide below. and conversion ratios directly from your agent dashboard. Based on contact type, classification, client status, and use of the lead transaction feature, you can visually track your progress against your goals as well as monitor where your clients are within your pipeline. There are two primary components involved. First, you will need to set the Lead Transaction information for each of your clients within their individual contact record. The second component involved is to set your goals in the Business Planning tool under My Dashboard. Once this step has been completed, you will now be able to track your yearly business goals. For additional instruction, please refer to this short video. With this latest upgrade, agents now have the ability to personalize emails sent to customers via the engageRE Agent Portal/LeadStreet! Check out the interactive document below to learn how to utilize this new feature. Ability to rearrange each section using "drag and drop"
Changing the title of "CRM at a Glance" to "At a Glance"
With the most recent change, email updates will be turned on automatically for new customer saved favorites. 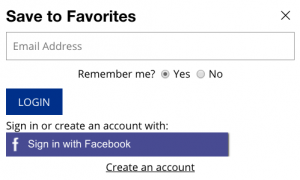 Once a customer saves a favorite on their Dashboard, this setting will automatically be enabled. Your customer will then receive an email update every time there is a change in the listing such as a price update or a listing status change. This is a new consumer touch-point that will keep your brand in front of your clients and let them know that you are actively engaged and working on their behalf! Clients can easily opt-out of these email updates by unchecking a new checkbox on the Client Dashboard on the My Favorite Properties page. NOTE: this will only affect new saved favorites, not those that already exist. We've made it much easier for a client to register on your website! When a client is prompted to register on your website, they will be presented with a pop-up window with streamlined choices. This should encourage registration and lead conversion. You will also notice some changes on a contact's profile page. There are now additional choices under the Client Status section such as New, Qualified Prospect, Appointment, Offer, and Pending. Note: any contact that had a client status of Under Contract, was migrated to Pending. Also on the Contact Profile section, the Real Estate Needs Profile was replaced with a new field called Contact Type. You can now identify your contact as a Buyer, Seller, or even an Agent. The icons to signify web clients and non-web clients have been added back! The first column of your Contact List will contain either a yellow globe to signify a web client or a blue Rolodex card to signify a non-web client. You will also notice a new column labeled Status that shows the new client status that you set within each client's profile. All of the Office Admin area is now mobile responsive. This includes Users, SB (Site Builder), Listings, and Clients. All postcards are now available all of the time (rather than only seasonally). Options will vary per region/company. All search related functions of CRM3 (saved searches, client homefinder, SEO pages, HomeTrends) have been updated to utilize the Search 3 engine. We are very excited to announce a redesign on a majority of the CRM to be mobile responsive! You will see this huge improvement on all pages under Leads, Marketing, Clients, Email, Website Templates & Layout. With this release, new and improved functionality has been added to the Contact List and Site Builder Website Layout Pages. A search-by-name function replaces the "rolodex-style" browsing function of the Contact List area. These lists will grow as work progresses.